I can't believe how fast our baby has grown. He'll be 6 months old next month. We really want our baby use to having his foot on the floor. He still hasn't tried to stand up yet. We know eventually, it will happen. When he feels comfortable. He'll try to do things for himself. We will encourage him to use his walker everyday. When I least expect it. He'll be walking on his own. Davin is so amused with the colors and sound. 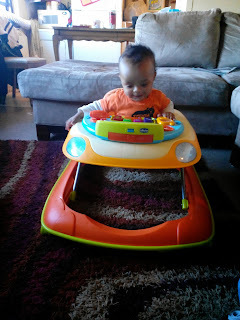 The Chicco Dance Infant Walker has so many activities to entertain my son. 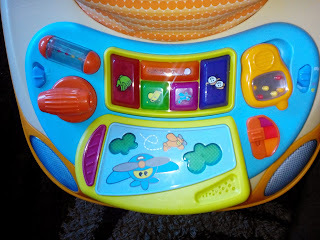 The electronic play tray can be removed for playtime anywhere and to eat snacks. We love the car look to the walker. The walker has everything for him to go. 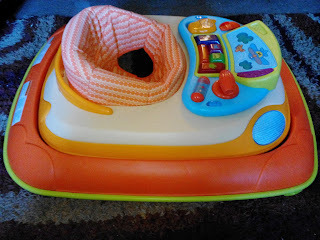 Chicco sent us their dance infant walker and electronic play tray. Davin is so happy! 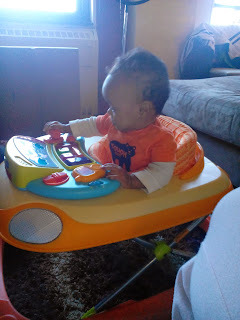 He played the light and sounds. We just love the colors on the walker. The colors are suitable for a boy and girl. We want our child to be entertained and browse around the house. This will be another step for him. We're happy to watch him explore. The electronic play tray requires 3 AA batteries (not included). A new feature not all walkers have is an MP3 drawer. 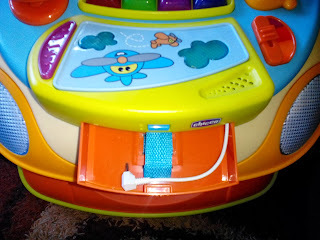 I can hook up my MP3 player and play my babies favorite music. My son enjoys lullabies. He would listen to the lullabies and it relaxes him. The walker has three adjustments for my babys grow. It can fold flat for storage and transport. I like to store it away. When my son isn't using it. We can accumulate so many things from our kids. This would make it convenient for us. It comes with a owner's manual and easy to assemble. I followed the instructions and assembled every part properly together. The manual comes with additional information for questions about the walker. The retail price for a Chicco Dance Infant Walker is $89.99. If you want to buy a Chicco Dance Infant Walker. 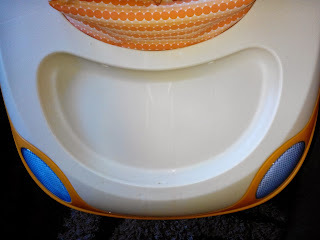 You can visit Chicco for online retailers. The walker comes in three colors happy orange, waterlily and sea dreams. To view other products or buy visit Chicco. Chicco has offered to giveaway a Dance Infant Walker to one of our readers. Enter the giveaway via Rafflecopter below. Disclaimer: ReviewIt PR was not compensated for this post. A sample was provided in-exchange for this review. The company is responsible for the prizes and shipment. We gave our honest experience in this review and is our own. ReviewIt PR is disclosing this accordance with Federal Trade Commission's 16 CFR, Part 255: "Guide Concerning the Use of Endorsements and Testimonials in Advertising. Do you want to have your product or furniture featured for a promotional review or giveaway email reviewitpr@gmail.com.